Video interview? Read this first. I was speaking with a restaurant owner in California recently. He was opening up a new restaurant and needed to hire 45 people. The interview process was taking quite a while, and he expressed his frustration to his son who offered an idea: have job seekers send in videos. Of course! Why schedule in-person interviews for everyone when you can meet them digitally? 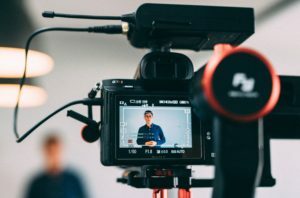 He opened up the process and got many “applications.” Turns out there are many video creation tools and almost everyone knows how to use them. It also turns out that he was able to instantly reject many applicants because the videos revealed a fatal flaw: lack of speaking ability. The story reveals two very important things: a) many digital tools have been created to showcase speaking and b) many people have failed to develop the skills needed to impress while using those tools. Think of the importance of verbal communication. Always important in face-to-face situations in the workplace and in social situations, right? But now verbal communication is critical in many more “places.” Fun tools (for examples, Face Time, Periscope, Marco Polo); business tools (Webex, Yammer); and tools that are used in business and social situations (Skype, Periscope, and iMovie). Speaking skills are on display in many ways, and how well or how poorly you speak will be noticed. If you want to succeed socially and professionally, improved oral communication is demanded now more than ever. Readers of Own Any Occasion know that all speaking involves creating a message and then performing the message. That applies to digital speaking, also. Here is a tip for creating an impressive video: Pay attention to appearance. Yes, of course that means your personal appearance. You need to have the right look for the occasion and dress appropriately. What people commonly miss is that you must also pay attention to the appearance of everything that will be caught on camera. What does the camera show around you? A sloppy desk? Odd items on the shelf behind you? Some wrappers from your lunch? Or if you record at home, an unmade bed in the background? A TV on in the other room? Before hitting Record, take a still shot and analyze the picture. Does it reinforce the impression you want to make? Set up the shot to make the whole picture impressive. Now for a couple of tips about performing in a video: first, look at the camera. In person, speakers are cautioned to make eye contact. It is critically important to look at the people listening to you to engage them and get feedback from them. In the digital world, it is critical to make eye contact as well. We do that by looking at the camera, not the screen. Everyone looks at themselves on the screen. Stop it. You already know what you look like. And if you are looking at yourself as you record, the video viewer gets a terrific view of your forehead because most computer cameras are at the top of the screen. Make eye contact with that camera! Look into the lens as if you are looking into the eyes of a listener. A tiny adjustment but one that makes your video stand out. Second, add life…lots of life. A small screen and a small speaker diminish oral communication. What sounds normal in person sounds dull in video. All speakers must work on adding more feeling/emotion to their talks as I mentioned in this video (https://www.youtube.com/watch?v=oKTE-txyQ40). Talking via digital tools demands even more. Record yourself saying, “I think I’d be an asset to your restaurant.” Play it back. Did it convince you? Keep recording until you hear what an employer would want to hear: someone clearly enthusiastic about joining the staff. Like the restaurant owner, many companies are using digital tools instead of in-person meetings to make hiring decisions. Thoughtful application of these simple tips can make your digital presence superior to the rest.